Don’t Get "Fooled" By A Quick Insurance Settlement! Don't Get "Fooled" By A Quick Insurance Settlement! If you've seen our commercials, you already know that insurance companies don't always have your best interests in mind. And for this reason, I always give victims of accidents this important advice: Don't say anything. Don't sign anything. But, what could happen if you actually do talk to the insurance company or cash an insurance settlement check? Brandon M. contacted our law firm yesterday because he wanted to tell us just that. Not only was he the victim of a catastrophic auto accident that almost killed him, but he was also the victim of an insurance company that offered him a quick settlement check for a life-threatening injury. On April Fool's Day 2011, Brandon was involved in an early morning auto accident just minutes from his home. A neighbor who heard the accident came out to find Brandon near death with a broken neck. 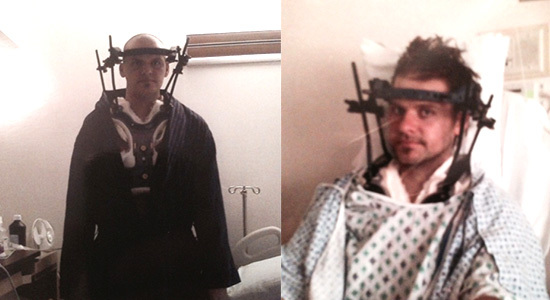 Brandon was left with a C-1 spinal fracture, known as a "Hangman's Break," which is similar to the injury that left former Superman actor, Christopher Reeve, paralyzed. Doctors felt the situation was so grave that they gave Brandon less than a 1% chance to survive, let alone to ever walk again. The insurance company soon approached Brandon's sister, his power of attorney, and was ready "to help." Amidst the shock, trauma, and emotion of the situation, she readily accepted a $3,000 settlement check. Little did she know that by cashing that check she forfeited Brandon's right to any future benefits to help cover the nearly $750,000 he would incur in hospital bills and physical therapy costs. With the help of physical rehabilitation therapy and time, Brandon beat the odds and learned how to walk once again. Today marks the three-year anniversary of his accident. Dealing with the insurance company is no April Fool's joke. If you are ever involved in a serious accident, contact our law firm first before you talk to the insurance company. Visit our Insurance Company Tips page to learn more. I would like to thank Brandon for reaching out to us to tell his personal story.